Max Occupancy: 5 AC two flat TV and cable.This unit has separate bedroom with one double bed. Outside there is another room with 1 QUEEN and one twin size bed with kitchenette. 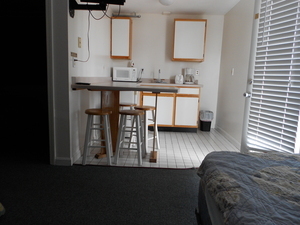 The kitchenette has refrigerator hot plate,microwave, coffee maker and toaster. Fry pan, Pots, dinner plates, mugs, spoons, forks, knives etc is provided. (for four) No smoking in room, No pets.